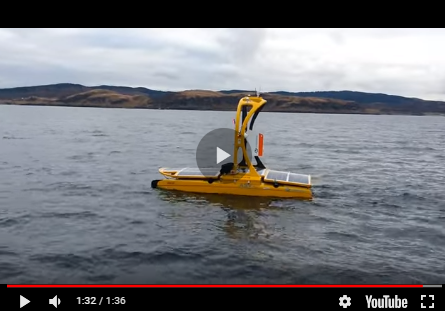 Researchers and engineers of the Alfred Wegener Institute Helmholtz Centre for Polar and Marine Research (AWI) have deployed the deep-sea crawler Tramper for a year-round, fully autonomous mission for the first time. Far from any controls, an underwater robot has been working for the past few days in 2,500 metres of water on the seabed of the Arctic, after the completion of a successful test run. The mobile underwater robot, which has been developed within the Helmholtz Alliance Robotic Exploration of Extreme Environments (ROBEX), will now perform weekly oxygen measurements in the seabed. Since this underwater robot is supposed to do all of this autonomously in the Arctic deep sea for a year at a water temperature near freezing point, though, the engineers and scientists are a little nervous. Therefore, the programme of the Polarstern expedition PS99.2 initially included a test run, which the AWI Tramper completed successfully: it was operating on the seabed for two days at a depth of 1,500 metres. Thereby Tramper travelled a total of 123 metres and performed seven measuring cycles, proving its operability. Accordingly, the stage was set to deploy the underwater robot on the evening of 11 July 2016 for its long mission at the AWI deep-sea observatory 'Hausgarten' at a water depth of 2,500 metres. A video-guided deployment system (the so-called launcher) brought the crawler safely to the seabed, where it is now to perform its measurements every week. It first moves 15 metres in order to reach an undisturbed area. An image recognition camera checks the surface there: if any stones or the like are recognised, Tramper travels on for another two metres. Then, a high-resolution photo of the measurement site is taken before the measurement begins. During this process, sensors are placed in the sediment in small increments of 0.1 millimetres, in order to measure the oxygen distribution in the seabed. After the measurement, Tramper goes to sleep for a week, to save energy. Ultimately, it should perform more than 52 such measurement cycles at a temperature of minus 1.8 degrees Celsius, which places a strong demand on the batteries. The scientists want to use the Tramper measurements to investigate the activity of microorganisms on the seabed. Engineers and scientists are already looking forward to their next expedition in the coming year. In the summer of 2017, they hope to pick up the Tramper safe and sound and full of valuable data.